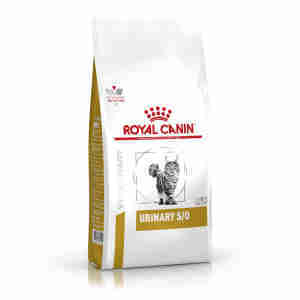 Royal Canin Veterinary Diet Feline Urinary S/O LP 34 is a complete food designed to treat cats with struvite stones and urinary tract problems. Urinary S/O is specifically designed to dissolve and prevent struvite stones from forming. If your cat is prone to struvite or calcium oxalate stones, this formula not only dissolves existing stones but will also dilute your cat's urine to prevent them from recurring. Urinary dilution also ensures regular bladder movement to help flush out your cat's bladder, getting rid of any nasty bacteria or remaining stones. Oversaturated urine offers the perfect conditions for struvite and calcium oxalate crystals to form – Urinary S/O has a low saturation to help combat this. Magnesium is a natural component of struvite stones; this food uses a low magnesium formula to reduce the possibility of them forming in the future. urine dilution makes stones less likely to reoccur. The most common urinary disorders are struvite and oxalate stones, which usually occur in female cats over seven years old but can also occur in males. Urinary problems are often hard to diagnose, as your pet may not show any obvious symptoms. There are a few things you can look out for if you’re concerned about your cat’s health. If your cat has abnormal urine patterns, difficulty urinating or if their urine becomes bloody or cloudy, it could be a sign of a urinary infection. You should consult your vet for a thorough examination and diagnosis. To dissolve struvite and calcium oxalate stones, your vet might suggest you feed your cat the formula every day for five to 12 weeks. If your pet is prone to urinary crystals, you can use the formula for up to six months to prevent reoccurrence. Because veterinary diets are formulated for the nutritional support of pets with specific clinical conditions, we recommend that you only use them under professional advice. For more information on feeding Royal Canin Veterinary Diet Feline Urinary S/O LP 34 to your cat, please consult your veterinary surgeon. Ingredients composition: rice, wheat gluten*, dehydrated poultry protein, maize flour, animal fats, maize gluten, hydrolysed animal proteins, wheat, minerals, vegetable fibres, beet pulp, fish oil, soya oil, fructo-oligo-saccharides, hydrolysed crustaceans (source of glucosamine), marigold extract (source of lutein). ADDITIVES (per kg): Nutritional additives: Vitamin A: 21500 IU, Vitamin D3: 800 IU, E1 (Iron): 41 mg, E2 (Iodine): 4.1 mg, E4 (Copper): 13 mg, E5 (Manganese): 53 mg, E6 (Zinc): 159 mg, E8 (Selenium): 0.07 mg - Preservatives - Antioxidants. This granules, keep my cat healthy and I been using Pet-Supermarket for more than 3 years . Very happy with the services . Had to change food for my cat and searched around tried these guys and the service is fantastic. Great product for your cat with urinary problems, my cat has had no repeat issues since being on this food. PetSupermarket provide an excellent service, great price and amazingly quick delivery.